China seems to move a step ahead with regard to other countries when it comes to innovation in the world of wearables. The GV08S smart watch by Aplus is compatible with Android as well as iOS smartphones and works seamlessly with them. This incredible smart watch does not limit the users with couple of features. The users can make calls, send text messages and can perform other activities as well, similar to that of a smartphone. The GV08S smart watch is designed with a case of stainless steel and a strap made up of rubber material which is quite soft and extremely comfortable to wear. Moreover, this smart watch phone is not very expensive. This fully featured watch will just cost you 33$. Moreover, it comes in three different metallic and stylish colors that makes it a trendy and elegant smart watch. If you are considering to buy a smart watch, then you must go through some of its exciting features mentioned below. This handy smart watch comes with many exciting features. Here we have discussed some of the amazing features of this smart watch phone. It flaunts a 1.54 inch TFT display screen multi- touch screen and a HD resolution of 240 X 240 pixels. It also comprises of a VGA camera which is positioned in an elegant manner at the top of the watch. This handy watch acts as a fitness tracker and notification center for the users. One of its greatest ability is that it acts as a sleep monitoring device for the users. This watch comes also includes a 500 mAh battery that ensures good battery life and durability to the users. The users can even insert a SIM card and there is also a slot for microSD card. Bluetooth functionality also comes integrated with this smart watch. You can use this watch as your personal health manager. It enables the user to monitor their daily movements, energy consumption, distance, number of steps, speed and much more. It thus helps you to keep a track of your health and achieve the desired health goals. Whenever, you will receive a call this watch reminds you about it. You just have to touch the watch in order to receive your phone call. This smart watch is compatible with most of the smartphones such as Samsung, Oppo, Hauwei, Vivo, ZTE, HTC, Lenovo and many more. This smart watch phone is a unique and handy smart watch which comes loaded with a wide range of features. It works just like your smartphone and make things more easy and convenient for the users. You can receive calls, send text messages, capture photos, play music, monitor health and sleep using this incredible smart watch. Moreover, the watch comes in three different and stylish colors that are black band and black dial, black band and golden dial, coffee brown band and golden dial. 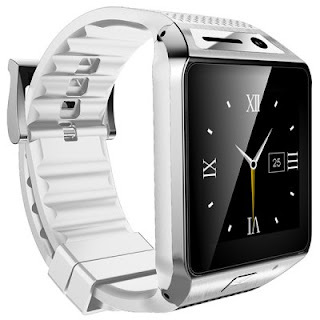 This smart watch is a must buy for all those users who wish to buy a stylish yet handy watch.